I have been teaching basic soapmaking for the past several years and have had a blast doing it. I teach cold process soapmaking what I call 101. I begin each class by telling how I started making soap and we discuss what got them interested in wanting to learn this craft and what their stories are. And then the class begins, we talk about the basic process, ingredients to be used, oils and butters plus most importantly lye safety. After a short demo, then the fun begins as I point to the area with various essential oils that they can use to scent their 2lb batch of soap and also herbs, clays and natural colorants that they can use to color their soap batch. It’s always a sort of frenzy as they start uncapping the essential oils and start sniffing. Some know right away what they want to use and others I help decide which one or a blend to use. When scent and color or not have been decided they begin to weigh out their ingredients and the artist and chemist come out! The excitement builds and it’s like herding cats trying to keep my eyes on where everyone is at so the soap batters do not get too thick and have traced and are ready to be poured into the molds. Then the soaps are covered and ready for all to take their soap batches home. They are all proud of what they have done and are so excited to share with friends and family their accomplishment. 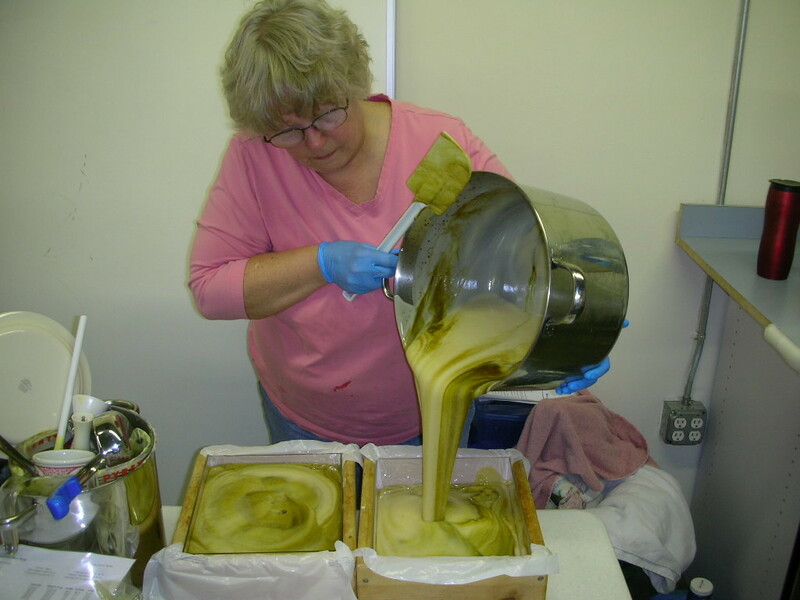 I so love teaching and sharing the joy of soapmaking ! Some of my students just make soap for their family but others have taken this new passion and have started their own businesses! This is my greatest joy in teaching and sharing and seeing it go forward! Love it!